The dog days of summer is here! New York experienced a week of brutal heat wave in July when everyone just loses any appetite or will to even turn on the stove. I always turn to cold soups at times like this. One of my favorite is, of course, light and sweet gazpacho, which really does not require any heat at all. Despite my fondness for gazpacho, sometimes I crave creaminess even in the middle of a heat wave, and I always made vichyssoise (cold potato soup) for these occasions. 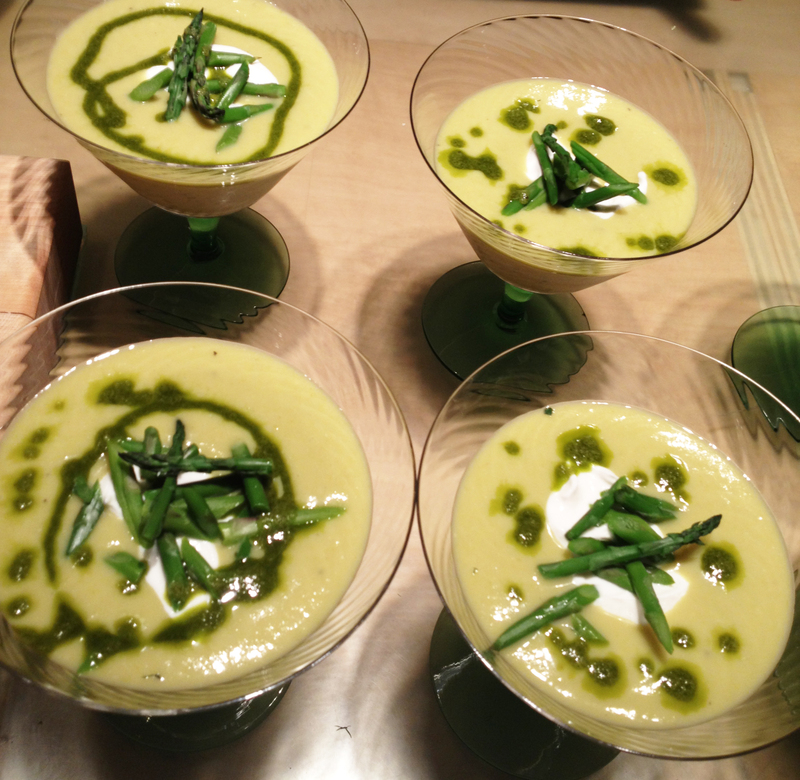 But recently I discover asparagus vichyssoise in my favorite cookbook Plenty, which is lighter and more refreshing than straight up cold potato soup (funny how unappetizing it sounds when you say cold potato soup instead of vichyssoise :)). Serve in a pretty glass cup with crusty bread and parsley infused olive oil. Peel the potatoes and dice roughly. Slice the leeks roughly after trimming tough green parts and washing muddy soil in between layers. Reserve 6 asparagus stalks for garnish. Discard the woody base of the stalks and cut the rest in 3/4 inch pieces. Sauté the vegetables, except for the asparagus tips, with the butter in a large saucepan for 4 minutes on medium low heat. Cover the vegetables with the stock and add the sugar, salt and pepper. Bring to a boil, then simmer, covered, for 40 minutes. At the end, add the asparagus tips and cook additional 10 minutes. Take the soup off the heat and blend the soup with an immersion blender until very smooth. Fold in the cream and half the yogurt. Do this by mixing cream and yogurt together first. Chill. While the soup is chilling, blanch the remaining asparagus for 2 minutes. Drain and refresh in ice water. Shred. Serve the soup in a pretty glass bowl. Spoon a dollop of yogurt on to and place the shredded asparagus in the center. Swirl some parsley infused olive oil. This entry was posted in Recipes and tagged asparagus, cold soup, gazpacho, potatos, vichyssoise, Yotam Ottolenghi. Bookmark the permalink.